Enough with the theory - show me the money. Quite literally, in fact: these low-volume production models currently sell for US$49,000 each. With a price tag like that, we were keener than ever to witness the magic first hand. 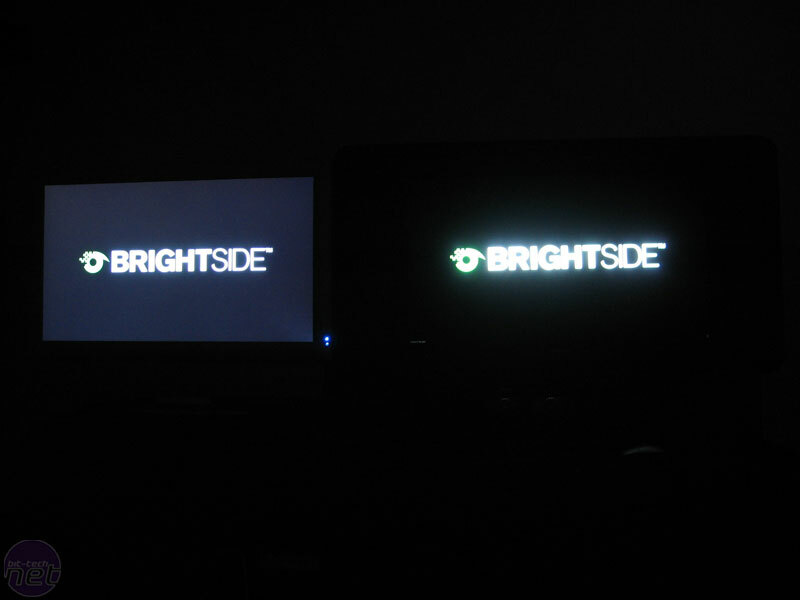 We were ushered into the small demo room at BrightSide's offices, where at one end of the room sat two 37" LCD displays: on the left was a stock retail Westinghouse 37" HD LCDTV display, and on the right, the DR37-P. A single machine piped an identical signal to each display via DVI, just as you would use the Clone function on a laptop to pipe a presentation to a projector. This guaranteed that the source remained constant, and the only difference would be in the way each display rendered that signal. The challenge we face today is demonstrating the dramatic difference that HDR makes within the confines of the inherently LDR environment of the Internet. We can't show you a pure HDR image because not only is all our camera gear LDR, but so is literally every monitor in the world. Until now. The best we can do is to show you some photos and video taken on the day, and support it with descriptions to help you interpret these LDR images. Hopefully this combination will allow you to imagine the real effect. We started the demo with the basics. Believe it or not, the first image shown to us was possibly the most profound. The signal was a full-screen, 100% black image. 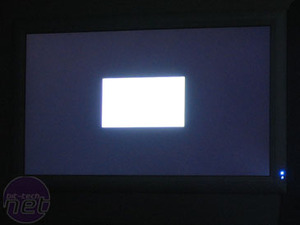 The regular HDTV, even with the brightness turned way down, displayed a familiar dark grey - the kind that most people would recognise as indicating the display was powered up, but no actual image was loaded. 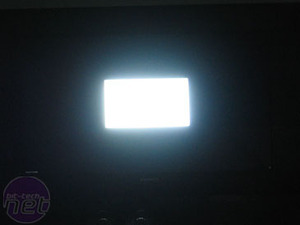 This is the back light "leaking" through that we discussed earlier. Amazingly, the HDR display looks dead, like they forgot to switch it on before commencing the demonstration. 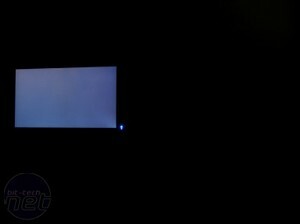 In reality, the signal calls for 100% pure black, so leveraging the theorectically infinite contrast ratio, the display simply kills the back light and delivers pure darkness. The next image in the slideshow was a simple, white rectangle. Again, the low dynamic range of the current HDTV shows up here. We adjusted the Brightness / Contrast settings, as well as the Backlight control, but the results were the same as explained before: a dull white box with a mostly dark background, or a bright white box with a light grey background. The HDR display, on the other hand, totally nailed it. The light from the box was so bright, or indeed, was of such great contrast with the surrounding area, that it almost hurt to look at. The back light behind the black areas was totally black, as per the first image, but the rectange was filled with the most luminescent light I've never seen from any display of any kind. You can see that our digital camera is totally overwhelmed by 3000 cd/m² of light - something that will become a familiar theme unfortunately. Incidentally, the rectangles left & right are identical, because it's just a split feed of the one signal. The halo or aura you see here - similar to what the our naked eye experienced - is a real world example of veiling luminance or Bloom, as simulated in the likes of Half-Life 2: Lost Coast. The third image in the presentation was the BrightSide logo on a black background, and unsurprisingly, the result was the same as it was for the rectangle test. The Westinghouse HDTV looked perfectly normal - just the image you would expect from a conventional display. 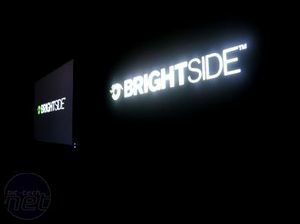 The BrightSide panel, on the other hand, was so sharp, so bright yet also so dark that from a distance, you'd swear it was a perspex shop sign with a bright neon lightbox. This product really is that different that your brain has trouble remembering that it actually is an LCD display. 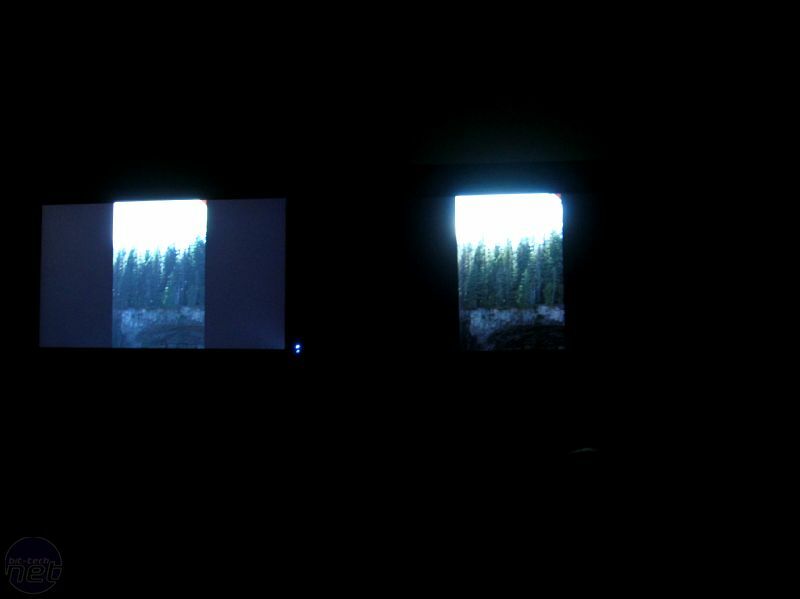 We then viewed a series of HDR still images. These are created using a photographic technique called Bracketing: many identical images are captured are varying exposures and combined digitally in HDR aware software such as PhotoShop CS2 or HDRShop. You can see an example of this in our HDR Overview article. Again, the signal to both displays was identical, yet while the BrightSide monitor displayed vivid colours, crisp detail and perfect skin tones, the $2000 Westinghouse was left floundering. It wasn't just the black borders being grey: next to the HDR screen, it just looked bland and frankly, rubbish. 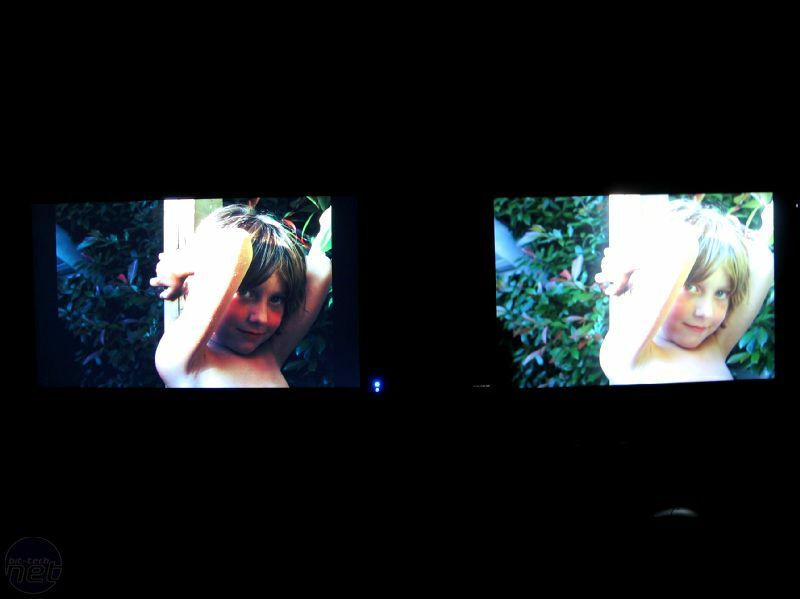 Bear in mind that this LCD TV is fully HDTV compliant, and produces a picture to match any current display on the market. This comparison hasn't been artificially stacked in BrightSide's favour; HDR really is that far ahead of everything else that today's best just isn't good enough any longer. Unfortunately, like The Matrix, nobody can be told just how amazing this display is; they must see it for themselves. We could rant for a week about how incredible the picture is, and you still wouldn't believe us. Our photos can only hint at the differences, as the CCD is totally overwhelmed by the 3000 cd/m² luminance this thing puts out. While we mulled over the challenge of how we were going to communicate the performance of this monitor to you, our readers, we ran through a few video trailers for Xbox 360. 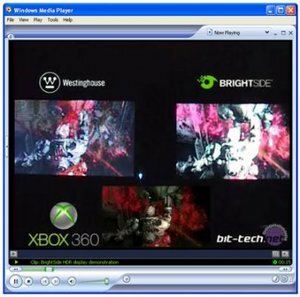 These were all LDR videos - the standard WMV trailers available on Microsoft.com - but BrightSide employs some clever algorithms to extrapolate HDR data from an LDR source. While the effect is theoretically not as good as true HDR content, the result is still such a massive improvement that you find it hard to swallow after a few minutes... because your mouth has been gaping all that time. This video was shot on a Sony DCR-PC9E DV HandyCam. 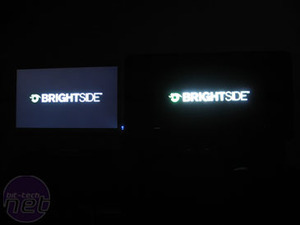 Xbox 360 footage was played on a PC, and the signal split identically to both the Westinghouse HD LCD TV and the BrightSide HDR display. You can download the original footage from Microsoft. 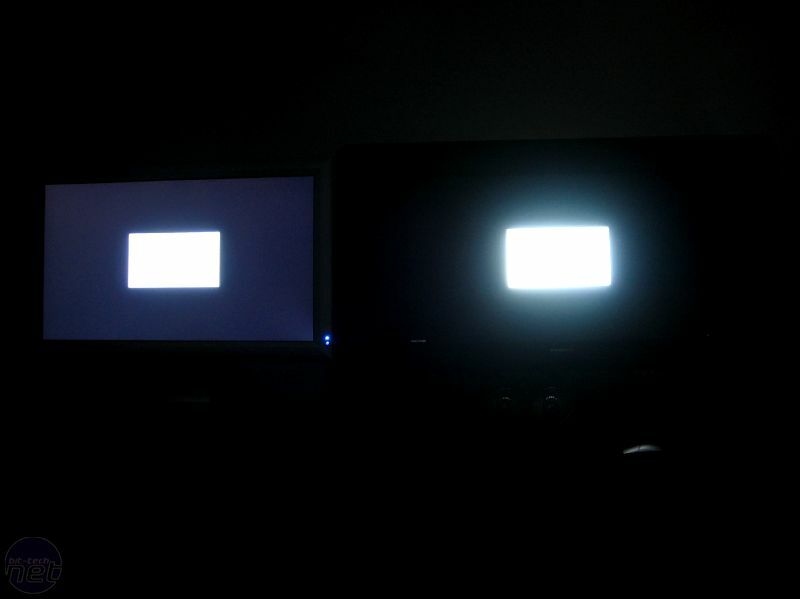 <ol><li>Blacks are black: in the Quake 4 trailer, the black segments are truly, 100% black on the BrightSide monitor vs 'grey' thanks to the uniform back light on the HDTV.</li><li>Highlights are bright: whether it's the muzzle flash in Quake 4, or the sun reflecting off the Aston Martin Vanquish in Test Drive Unlimited, the bright highlights of a scene are as they should be - very bright. Certainly too bright for our camera to capture accurately.</li></ol>As we have said, it is impossible to convey the full effect of HDR without seeing it in person. This video can only serve as a guide at best: it shows the black vs grey at the low end, and basically, any time our camera can't handle the extra luminance, you will just have to imagine a really dazzlingly bright scene. 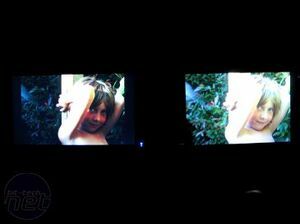 It is also worth noting that these videos are LDR being extrapolated to HDR by the display. Once the industry reaches the point of producing true HDR video at the source, you can expect the effect to be even more dramatic.